Leonardo da Vinci was a master of observation. He had very little formal education as an illegitimate child growing up in Vinci, Italy. In order to satisfy his ever-curious mind, he learned to observe the world around him. He’d watch birds in flight, observe water flowing around rocks and marveled how light creates shadows. He watched, took notes and theorized how things worked. Experiments and drawings would follow to test his theories. His studies informed his artwork. Instead of merely painting the human form, Leonardo dissected cadavers to better understand the body, its musculature and movement. 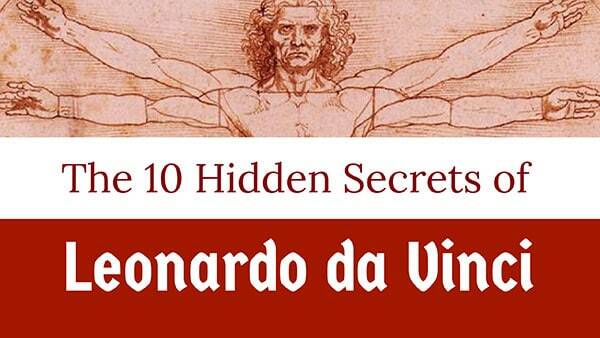 These 10 secrets of Leonardo da Vinci highlight some of the more fascinating details from the life of the creative genius. 1. Leonardo never mastered Latin. Leonardo had little to no traditional education as a child. As the son of an unmarried couple, he was shunned from attending Latin schools. Leonardo defiantly became self-taught—a student of experience and experimentation. Nature was his classroom. He learned to observe, theorize and then rigorously test his knowledge. His passion for learning can be seen in his detailed and illustrated notes and codices. 2. Leonardo believed that sculpture was a lower form of art than painting. He felt sculpture was less noble than painting because it required “less ingenuity” and didn’t concern itself with “all things perceptible in nature.” Specifically, a sculptor could create his work without concern for color, light and shadow, he stated. 3. Leonardo saw himself as much more than just a painter. He described and promoted himself as a mechanical engineer, military engineer, architect, inventor, hydraulic engineer, and philosopher—as well as an artist. He wouldn’t be pigeon-holed. You might like short, deep quotations from great minds. 4. Leonardo experimented with non-traditional perspective in some of his paintings. If a painting was to be located on a wall where it would be viewed mostly from an angle, he would distort the image to create the optical illusion of correct perspective from that angle. This is called anamorphosis. In other paintings he employed “complex perspective” techniques—in the mural of “The Last Supper,” for example. Large murals or wall paintings were often viewed from the side or from a distance. Leonardo painted with accelerated foreshortening to correct for the viewer’s angle and distance from the painting. He wanted the work to be realistic from all different vantages. 5. Leonardo is credited with conceiving many inventions that would take decades and even centuries to first appear. Underwater diving suit (similar to scuba gear). 6. Leonardo described his philosophy of art: there are no lines in nature. Leonardo mastered the technique of sfumato, from the Italian word fumo (smoke). The artistic technique depicts color tones in infinite gradations between shadow and light. In Leonardo’s words, “between light and darkness there is infinite variation, because their quantity is continuous.” Leonardo knew from his studies and experiments that harsh borders and lines are not seen by the human eye and therefore he did not paint them that way. See more famous last words of famous people. 7. Leonardo was known to dissect human and animal bodies. His anatomy studies began as research for understanding the human form for his paintings. His research went beyond just informing his art to a full-scale physiological understanding of the body. There were no limits to the level of his interest. For example, he would remove a human eyeball and slice it apart in order to better understand its function. 8. Leonardo was a vegetarian. The painting “Salvator Mundi”—showing Jesus blessing while holding a crystal orb—sold for a record $450.3 million at auction in 2017. The price was the highest amount paid for a work of art at auction. The painting had been lost to history because of damage and many coats of varnish that had obscured the image. In 1958 it sold for under $100 at auction. In 2005 it was rediscovered and authenticated as an original Leonardo. 9. Leonardo wrote his notes in mirror script. Adding to the genius mystique of Leonardo are his many volumes of notes written in mirror script—held up to a mirror they would read correctly. But the reason he wrote this way was simple: Leonardo was left handed. Writing from right to left was more comfortable for him and easier to do. Some have suspected he did this to disguise his notes, but this theory is widely believed to be untrue. 10. Leonardo frequently left art commissions and personal projects unfinished. The Mona Lisa was a commission project for Francesco del Giocondo, a wealthy silk merchant to the Medici. He never received the painting. Other works like the Sforza horse monument and Battle of Anghiari mural were abandoned by Leonardo and never completed. Aristocrats and royalty would hound Leonardo for personal projects that never began. Later in life, Leonardo had tired of painting and could not “bear the sight of a paintbrush,” according to contemporary reports. Leonardo was born April 15, 1452 in Vinci, the Republic of Florence, Italy. He died May 2, 1519 in Amboise, France. Leonardo was not particularly friendly with rival painter and sculptor Michelangelo. In fact, the upstart Michelangelo would taunt the venerable and respected Leonardo in public settings. Leonardo, 23 years Michelangelo’s senior, probably didn’t think much of the younger artist’s abilities, but he kept his opinions of him more or less private. The iconic work by Leonardo depicts Lisa del Giocondo, a Florentine silk merchant’s wife. Painted from 1503 until the end of Leonardo’s life around 1519. The famous painting can be seen at the Louvre in Paris, France. Leonardo was commissioned to paint the great mural in the 1490s for Ludovico Sforza, the Duke of Milan. It is located on an end wall at the monastery of Sant Maria delle Grazie in Milan, Italy. Leonardo drew his Vitruvian Man around 1490. The drawing beautifully illustrates the ideal proportions of the human figure, as described by the ancient Roman architect Vitruvius. It is currently held by the Gallerie dell’Accademia in Venice, Italy. The painting from about 1489 features an enchanting image of Cecilia Gallerani, a mistress of Ludovico Sforza. It is one of only four known portraits Leonardo painted of a woman. The painting is on display at the National Museum in Krakow, Poland. The Codex Leicester is a collection of 72 pages of Leonardo’s scientific writings, exploration and insight. It is named for the Earl of Leicester, who purchased the work in 1719. The Codex was purchased in 1994 by Bill Gates for nearly $31 million at Christie’s auction house in New York.